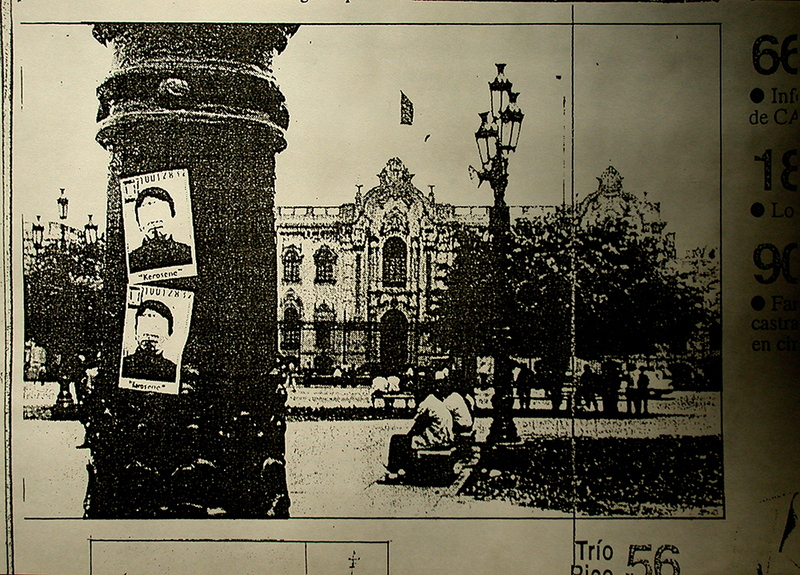 Fotocopia del diario La República, fecha desconocida (vista de la Plaza de Armas de Lima con stickers "Kerosene" en un poste, noviembre de 1995). "Kerosene" (1995) was the beginning of a campaign to call attention to the Amnesty Law that was just issued by the Fujimori regime. The plan was to paste stickers, displaying the face of the paramilitaries that were granted amnesty, in places of political significance in Lima. The anonymous action would be repeated every week, with a new face. The project was supported by APRODEH (Asociacion pro Derechos Humanos). The SIN (Servicio de Inteligencia Nacional) was commanded to find the author and stop the campaign. The author was arrested; APRODEH was able to put pressure for his immediate release. Still, the underground style of the campaign brought opposition from other human rights organizations at that time. They were afraid it might have been interpreted as actions related to terrorist groups. As a result, APRODEH canceled its support for the project. During the following months, the author received threatening phone calls.